On Dakara, both Maz'rai and Ka'lel have shown strong support for the proposal of Bra'tac and Teal'c to dissolve the council in favor of democracy, however, when they suddenly reverse their positions, Bra'tac and Teal'c suspect brainwashing. Meanwhile, Mitchell visits his old friend, Bryce Ferguson, in the hospital where he is undergoing tests for an old shrapnel wound to the head sustained during a mission in which he saved Mitchell's life. Now consumed by guilt that he got the position at the SGC over his friend, Mitchell is further devastated to learn that Ferguson has developed an aneurism from which he is not expected to recover. Bra'tac brings word to the SGC that Teal'c had left for Chulak to gather support and has not returned. As Carter and Daniel join Bra'tac's search, Teal'c awakens in a Goa'uld stronghold where he faces torture and is confronted by his captor. It is Ba'al who has brainwashed many among the Jaffa, intending to offer himself as a leader capable of uniting the Jaffa against the Ori, but his repeated attempts to persuade Teal'c are futile. As Mitchell prepares to rejoin his team, he first obtains permission for a final gesture of support for his friend. The Galaran memory device will allow Ferguson to experience Mitchell's missions with SG-1. Mitchell joins his team as a joint rescue mission engages Ba'al's defenses with aerial support from Bra'tac. 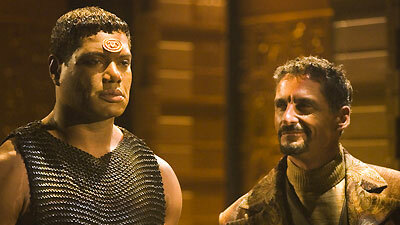 However, Bra'tac is captured and brought before Ba'al just as Teal'c appears to have succumbed to the mind control techniques. Ordered to kill his Jaffa master kneeling before him, Teal'c pauses, and instead turns his weapon on Ba'al, killing him. Following their escape, the Jaffa Nation successfully votes to embrace democracy, but Mitchell returns home to the news that his friend has died, and Teal'c reminds him that "To resist the influence of others, knowledge of oneself is most important." Mitchell takes the words to heart. He is working on it. Bryce Ferguson, from Iowa, was a longtime friend of Mitchell's. Both were up for the classified position in the 302 program, but Mitchell got the assignment. Ferguson got shrapnel in his head four years ago saving Mitchell's life. The shrapnel originally lodged itself against an intracranial artery and eventually formed an inoperable aneurysm. On Dakara the referendum passed, bringing the beginning of democracy to the Jaffa Nation.